We’re been talking about the best way of representing how FHIR resources relate to each other. 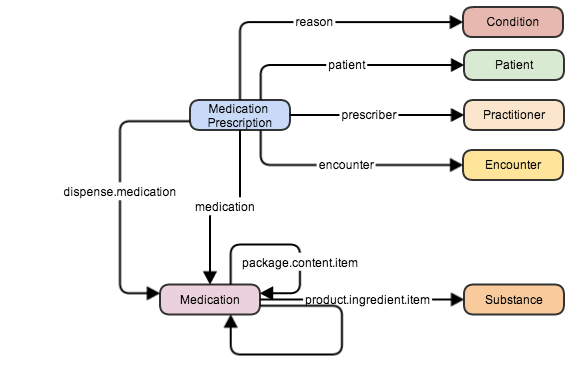 It’s reasonably easy to do this for technical people – they’re familiar with the idea of tools like UML models and XML / XML Schema, but not so easy for clinicians and other non-technical folk. 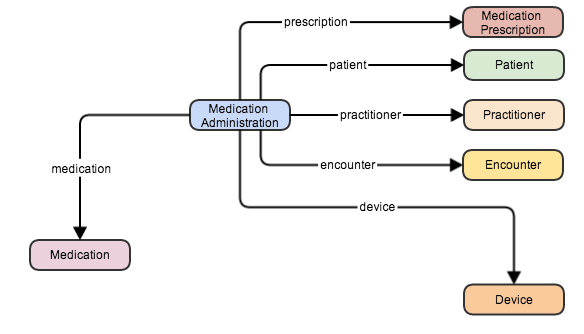 FHIR is based the concept of resources that can relate to each other – a term I’ve heard used is that they represent a ‘web’ of resource connections, which is quite a nice analogy. It’s exactly how the World Wide Web works – and everyone knows how to use the web, but fewer are familiar with the standards and constructs that underlie how all this works. A resource (as you doubtless know by now) represents a particular ‘thing’ that makes sense as a separate entity. Examples are patient, practitioner, condition (problem), encounter, allergy etc. A resource contains a collection of properties (like name, date of birth, address), and these properties either have a value (and the structure of that value can be complex – that’s the datatype) or is a reference to another resource (hence the concept of the web of resources). We thought it might be interesting to represent these connections as a connection of nodes, where each node is a resource (the other properties of the resource aren’t shown in these diagrams). Note that this is a ‘specification’ view – it shows the connections that are defined in the spec, not necessarily how you’d represent them in a real instance. For example, where a single property could be linked to different types of resource then both links are shown. Also in a real situation you’d probably put the patient in the centre and there would be multiple instances of many of the resources. So here are some diagrams for some of the clinical concepts – just to see if they are useful (Note that the colours of the resources don’t have any significance). So we’ll use a couple of diagrams. And finally lets think about allergies. There are a couple of key resources here – AllergyIntolerance (which records what the allergy is to and who recorded it), and AdverseReaction – which records the actual reaction that occurred. Well, that’s all I’m going to do at the moment – I’m not 100% sure how valuable these representations are, if you like them and want me to do more then leave a comment! And remember – these relationships are just what the core spec refines. They can be adjusted and augmented to meet your own business cases using Profiles and Extensions. The planning for the 5th FHIR connectathon is underway, with an announcement yesterday on the FHIR list server encouraging people to review the registration site, and to register as soon as the registration is open (which I absolutely encourage you to do). This will be the first connectathon that I won’t be at – which is kind of sad, but had to happen at some point. 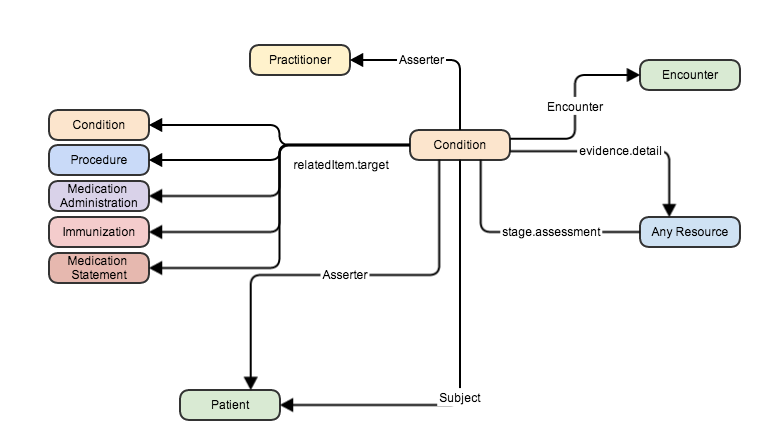 Although I’m in the middle of a series of posts on FHIR & XDS (and a bit behind to tell the truth – work has got in the way of the fun stuff), I thought that it might be of interest to discuss some ‘connectathon-related’ topics – starting with the conformance resource. We’ve talked about this before in the context of a server using it to indicate to a potential consumer what it’s capabilities are (and been quite good in actually producing examples in our discussions), but it has also been designed for use by a client to indicates what it requires of a server. In the case of connectathon, we encourage clients to create a Conformance resource to indicate what they need of a server as they fulfill the scenarios. A client will set the Conformance/rest/mode/@value value to ‘client’ to indicate that it is specifying a requirement rather than a capability – and the other parts of the resource mean the same thing that they to for a server. The conformance resource is not – necessarily – used for machine processing, but rather as a uniform way that servers and clients can indicate and match capability & requirements. For example, they are very useful in the planning stages of a project when clients and servers are being located and/or designed. As a FHIR resource, a conformance statement can be stored in a FHIR server, and has the same versioning capabilities as any other FHIR resource. This makes an excellent choice for locatable documentation once the systems are in operation. Following on from the previous post about REST in general, let’s dig in a bit more and start manipulating a single resource in FHIR. We’ll read an existing resource, update it and create a new one. Something to create and view XML and JSON resources. You might also want to download the FHIR schema files from the spec (look for the link that says ‘FHIR Schema & Schematrons). Depending on your environment, there are many options for both of these. To keep thing simple I’m going to use a chrome browser extension (Postman) for making the HTTP requests, and the Oxygen XML editor for the XML/JSON stuff, but you choose what works for you. I’m going to assume that you know how to use these tools – or are at least willing to find out! Before we start – an important message about the ‘@’ symbol. Currently, the FHIR specification uses the ‘@’ symbol in a URI to make it clear which part of the URI is the ID for the resource. This is going to change in the next version of the spec, and it will be removed, however it might take some time for the test servers to be modified. If you get weird errors when trying the instructions below, then remove the ‘@’ and see if that helps. To read an existing resource when you know its URI (i.e. the server location and ID on that server) you use an HTTP GET request. I’m using Grahames’ server for this example which is a public server that anyone can change, so the details may be different for you. I asked the server to return the resource in the XML format, by setting a request header – Accept – to ‘application/xml+fhir. 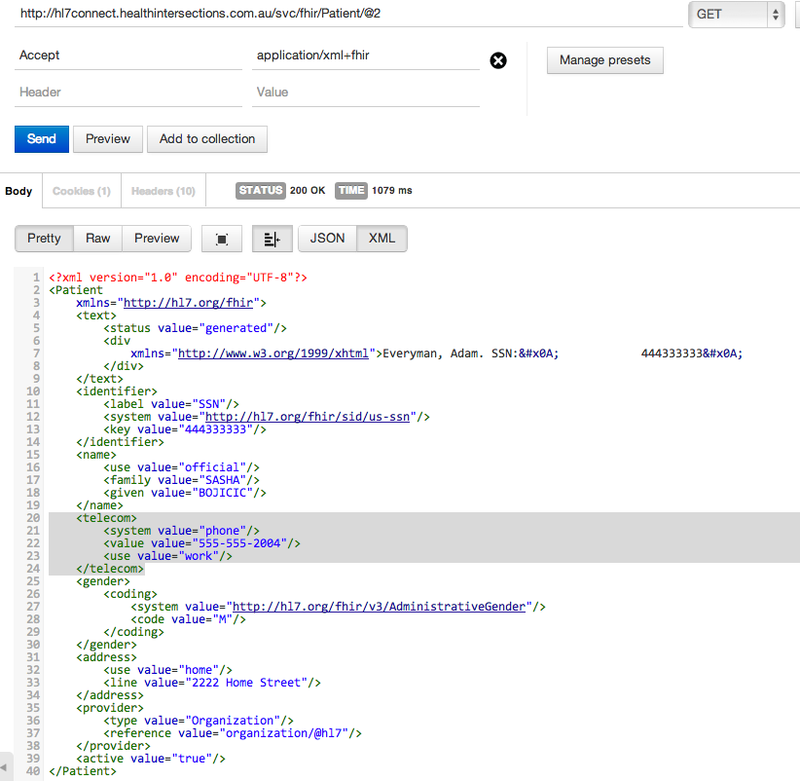 I could have set the Accept header to ‘application/json+fhir to get a JSON formatted resource – try it! Here is a bit more on these mime-types. The Status Code was 200 – which means that everything worked OK. 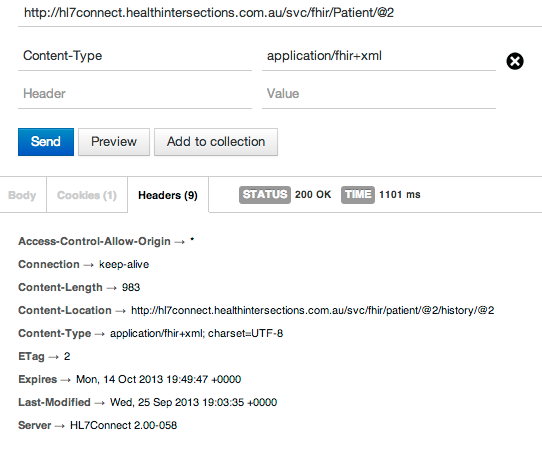 The Content-Location header has the value http://hl7connect.healthintersections.com.au/svc/fhir/patient/@2/history/@2 . This is a ‘version specific’ URI – it specifies not only the resource Id, but also the specific version of this resource – in this case it’s the second version. The content-type header tells us that this is an XML format. There are a number of other useful headers that we won’t go into right now. Lets update this resource. What we’ll do is to copy the resource we just retrieved into our XML editor, make some changes, paste them back into Postman and PUT them to the server. Optionally, we’ll validate the updated resource using the FHIR schema before we send it to the server. If you want to, you can check that this is valid against the FHIR schema by associating the updated file with the correct XML schema (it will be Patient.xsd in whatever folder you downloaded the schema to) and clicking the ‘validate’ button in your editor. Step 6: press the Send button. The spec does not require that version numbers are sequential ones – although Grahames server does do this. Others (like Ewouts) use a different scheme – all that matters is that a new version of a resource gets a new version number. We used PUT and not POST because we knew the full URI (including the resource ID). POST would have indicated that we wanted to create a new resource – as we’ll do in a minute. If you PUT to a URI, and there is no existing resource at that URI then it will still be saved, but the status code that is returned will be 201 rather than 200. At the moment, when you update (or create) a resource, then the FHIR server will return the resource it saved. This behaviour will be changed to be more consistent with the HTTP spec in the next FHIR version, and the resource will no longer be returned. Send the request to the root for that resource on the server – e.g. 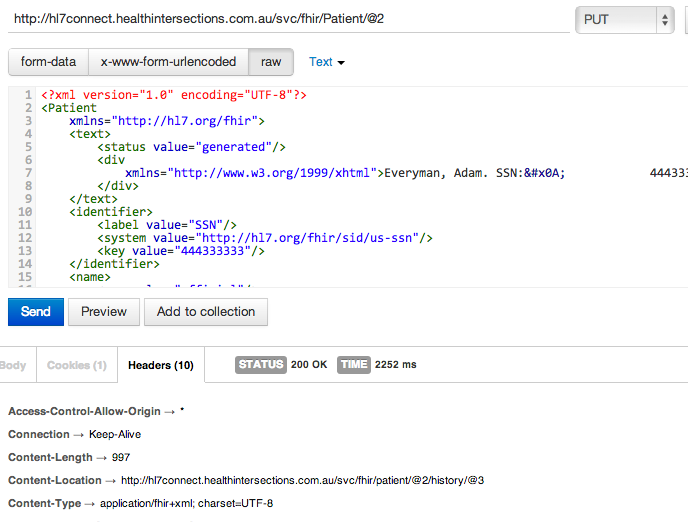 http://hl7connect.healthintersections.com.au/svc/fhir/Patient in the case of Grahames’ server – rather than to a URI (after all, you don’t know what ID the server is going to assign to the new resource yet). All you have to do is to change the URL in POSTMan (get rid of the /@2 at the end of the line), change the method to POST and press <Send>. The server will process the request and return a response. This time the status code will be 201 – indicating a new resource was created. The actual URI for the resource will be in the Content-Location header (and it will, of course, be a version specific URI). A question that came up from the previous REST post was about who creates the resource ID’s. In particular, can a client create the ID rather than the server? It is certainly possible for the client to assign the ID – in FHIR, if a client PUT’s a resource to a URI (i.e. includes the ID) and there is no resource already there, then the server will create the resource using that ID (it returns a 201 status to indicate that this has happened). The issue with this of course is in potential ID collisions – what prevents 2 clients using the same ID for different resources? However, FHIR takes the view that this is a deployment decision, and is up to the implementers and trading partners using the server. They could insist on GUID’s as the IDs for example. Do play around with reading, creating and updating Patient resources. You can try creating entirely new resources in your editor (and don’t forget to use the schema validation so you know you have a valid resource). Read the documentation for the Patient resource to find out what properties you can add, and don’t forget to look at the examples that are in the spec (in a tab at the top of the page). The next post in this series will start to explore the topic of searching – how do you find a resource when you don’t know its URI – and where we’ll be introduced to a new construct – the resource bundle.